Geek Lit Etc. 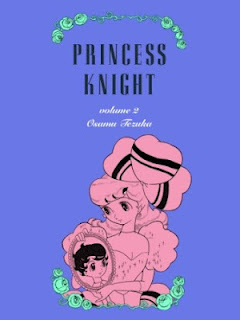 : Manga Monday: Can someone raised as both a boy and a girl ever be comfortable in her own skin? We left Sapphire and the gang in some pretty dire straits at the end of Volume 1, and it doesn't get much better here, either. Sapphire's mother had been turned to stone, a witch steals her girl heart, and now Duralumin is bent on stealing her boy heart to finally give his son Nylon a backbone. There's Prince Franz Charming, a handsome pirate, and even a female love interest. We get visits from wicked witches, Venus and Eros, satan, and even The Big Man Upstairs makes an appearance. Not to mention two failed weddings. With all that, it's a wonder that we end up with a coherent story at all, and unfortunately, at times we don't. Characters are thrown at us just as fast as Tezuka can drawn the, and while it all does make sense in the end, the ride is enough to make your head spin. That's not to say that the story isn't good. Franz Charming's voyage through the gardens of Venus is some of the most detailed, beautiful art to be seen in the series. Watching the women of the castle band together in support of Princess Sapphire shows the backbone that even traditional, downtrodden women can have. And watching Tink fight his way out of the traps that the demons set for him still makes me smile. In the end, the largest problem that both this volume and the first one has is that the stories weren't written to be read in collected volumes. These stories were originally serialized, and would read much better at a once-a-month pace. When several chapters are read at a sitting, the action simply becomes overwhelming. The gender roles never get addressed in a satisfactory manner either. I was really hoping that Sapphire and the gang would finally learn that she needs to be herself, and if that means fencing and being strong while being a female, then so be it. But even in the tournament, both Sapphire and Friebe act mostly as men, to the point where Sapphire won't admit to being a woman, even to her, until it's almost too late. And seeing Friebe's brother say " You can find brave women who are as manly as any man in every country" could be taken many different ways. But at least in the end, neither she nor Sapphire seem repentant about their actions. And perhaps that's the best a manga written in 1950s Japan can be expected to do. Highs: Behind every good Princess is half a dozen people willing to go to the ends of the world to save her. Lows: Too much to read in one sitting. Verdict: Not Tezuka's best work, but it certainly still belongs in any manga collection.